We have already covered the earlier ownership of the manor of Eshton and its hall and can now look at its history after the Wilson family came into possession of Eshton Hall in 1646. 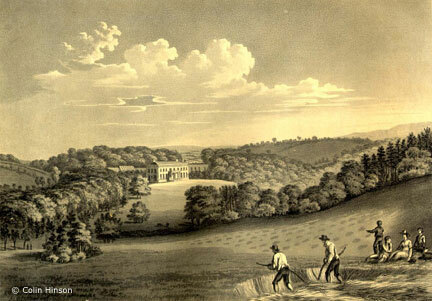 The Wilson family were associated with Eshton Hall for over 300 years, from its purchase until its eventual sale to the Eshton Hall Education Trust in1960 and a separate page includes a brief pedigree of the Wilson family. 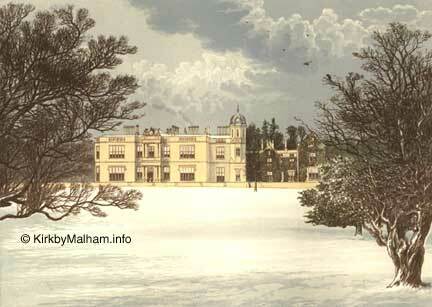 Eshton Hall is the seat of Sir Mathew Wilson MP; it was erected in 1825-7, Mr. Webster of Kendal being the architect. In the library are some very important MSS. which are described in the Appendix to the Third Report of the Historical Manuscripts Commissioners, and comprise forty-one volumes of Dodsworth's Yorkshire Collections, a fifteenth century Chronicle of London and the correspondence of Dr. Richardson. There is also a fine library of books, chiefly consisting of a portion of the collection of the late Miss Richardson Currer, whose portrait by Masquerier is in one of the rooms. There are some fine pictures, notably portraits of Cromwell, Fairfax, and General Lambert, all said to be by Walker; Charles I in armour, his hand on a glass globe, this picture was brought from Browsholme; Diana and Actæon by Rubens; Virgin and Child, Vandyck; Heliodorus driven from the Temple, Vandyck; Centaurs and Lapithæ, Luca Giordano and a large water-colour drawing of Thurland, in the Valley of the Lune by Turner. Description of the Hall from A Series of Picturesque Views of Seats of Noblemen and Gentlemen of Great Britain and Ireland describes the last remodeling of the building by the Wilson family. Eshton Hall, formerly the residence of the "De Esshetons" (Ranulf de Eston was living in 1186, and John de Eston contested the right to the Earldom and estates of Albemarle with King Edward the First,) passed into the Clifford property, and was sold by George, Earl of Cumberland, in 1597, to Robert Bindloss, Esq., of Borick, and in 1646 the hall, estate, and manor were sold by Sir Robert Bindloss, Bart., to Mathew Wilson, of Kendal, a merchant clothier, and Blackwell Hall, factor, of Coleman Street, in the City of London, ancestor of the present owner. 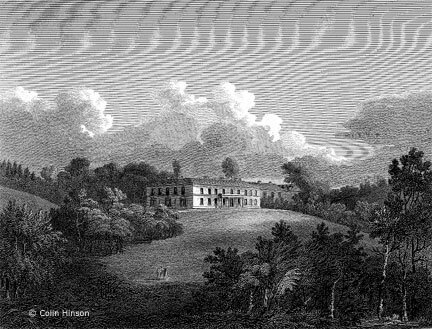 The house, rebuilt by his father in 1825-6, from designs by the late George Webster, of Kendal, architect, is of white freestone, on an eminence that commands a beautiful home view, is entered by a portal consisting of massive piers, faced with Doric on the basement, and surmounted by Ionic pilasters, finishing at the summit by a pierced battlement and rich scroll-work. The entrance is thirty feet by twenty feet, opening by folding doors on a handsome saloon; staircase of carved oak, thirty feet square, lighted by a dome; on the right the dining-room, thirty-six feet by twenty-four feet; beyond this the morning-room, twenty feet square; on the left the library, forty feet by twenty-four feet, with a bay window, and communicating by folding doors with the drawing-room, thirty-four feet by twenty-four feet, with a bay-window; all these rooms are sixteen feet high. The billiard room is behind the staircase, thirty feet by twenty feet, opening into the staircase and into the drawing-room, and by the bay-window into the flower garden. The library and drawing-room, fitted up as a library, contain ten thousand volumes, especially rich in topography, collected by the late Miss Richardson-Currer, Sir Mathew Wilson's half-sister. There are portfolios of engravings, articles of vertu in marble, bronze, nola vases, cabinets, and china; a good collection of pictures by old masters, and family portraits. After Richard Henry Wilson inherited the estate in 1919 on the death of his father the 3rd Baronet, the fate of Eshton Hall was not so happy. He quickly started to dispose of its assets, with the first sale in March 1919. In 1916 the remaining part of the famous library was sold and in 1919 the outlying portions of the estate came under the hammer. This included many farms and properties around Gargrave, including the Stainton Cotes estate and the Wilson Arms at Threshfield. In 1923 the hall was leased by Arthur Stanley Wills of the tobacco company WD & HO Wills, who lived there until his death in 1935. During the Second World War many private schools moved out of towns into the country and in 1940, Bramcote School from Scarborough moved into the hall, remaining there until the end of the war. After they returned to Scarborough in 1945 a master at Bentham Grammar School, Ronald W Purdey, established a new school in the already adapted building and Eshton Hall school opened in 1946. The hall was initially leased to the school by Sir Mathew Martin Wilson, but it was eventually sold to the Eshton Hall Education Trust in 1960. Its life as a school was not to last much longer though and it suddenly closed in 1966, a victim of the social and economic climate of the time. The hall then became a residential nursing home, initially very profitable ventures, but of late also falling victim to falling profits and rising overheads, this finally closed at the end of 2002. Eshton Hall was in a much neglected state when it was finally purchased by the DARE Group. This property development company sought and finally gained permission to convert the listed hall and its remaining outbuildings into 13 apartments and 5 cottages, which were put on the market in 2005. History of Craven by TD Whitaker, 3rd enlarged edition, edited by AW Morant, published 1878. Details of Eshton Hall from the National Park's Out Of Oblivion website. Gallery of aerial images of Eshton Hall from the DARE Group who converted the Hall into apartments and cottages in 2005. Eshton Hall Boarding School (1946 - 1966) a website lots of photos of ex pupils and the building. Accounts for the remodeling of Eshton Hall (1825-41) in the YAS Bradfer-Lawrence collection. Household accounts of Mathew Wilson of Eshton 1771-1786 in the YAS Bradfer-Lawrence collection.